This Sunday 25th June 2017 is National Unplugging Day where families vouch to #GoGadgetFree for the day. Screen-time is a concern for many families especially with a growing trend of children being stuck to their gadgets at unsociable times such as whilst eating meals. It is feared that children are missing out on the great feel-good things we did when growing up – or getting enough exercise. Also adults are guilty of spending too much time on gadgets and in front of screens – so going a whole 24 hours without will do everyone the world of good. What better way to prepare for National Unplugging Day than a weekend Glamping! Leaving the devices at home* removing the temptation to go on them and finding new creative ways to spend time. 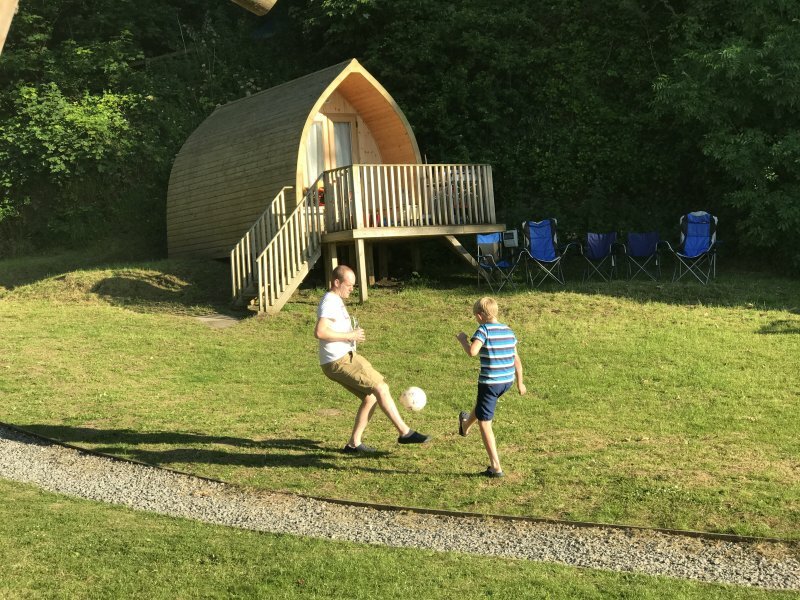 We were invited by Campsites.co.uk to stay in a safari tent, at John Fowler Holidays Ltd.’s Sandaway Beach Holiday Park in Combe Martin, for the weekend. The two bedroom accommodation sleeps 4-6 people with proper beds (and a double sofa bed), a proper living area with full size dining table and chairs, electricity and a mini-kitchen with running water. 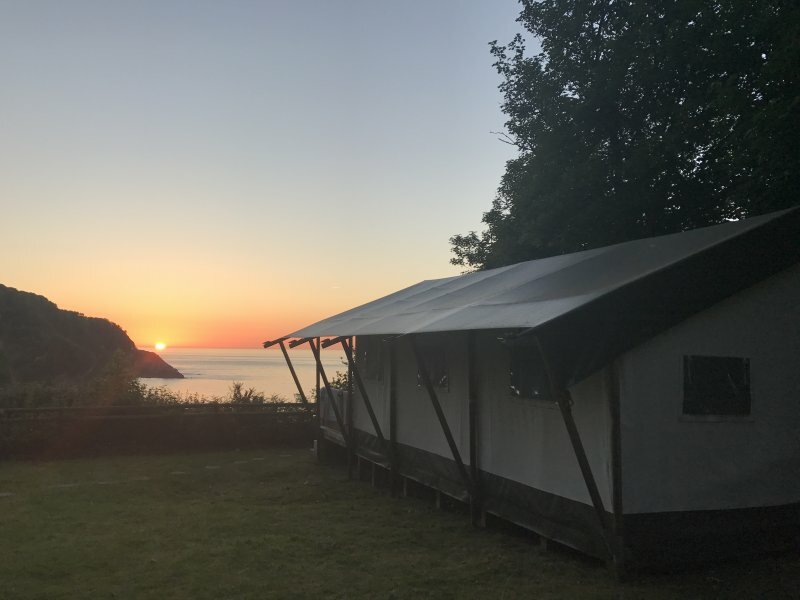 Beautifully situated in the Glamping field, the Safari tents overlook the sea – enabling guests to sit on their balcony to watch the sun rise and set. Not only do you not have to worry about carrying a tent (especially great for those travelling by plane) but also included are soft duvets, linen and plenty of blankets. There are also lamps, a heater and all the cutlery, crockery and utensils you need to cook and eat with. There is ceramic twin burners, toaster, kettle, a sink and fridge (with small freezer compartment). The campsite has a toilet block right next to the Glamping field and a toilet and shower block a very short walk away. There is also an indoor and outdoor play area, games facilities (both pool and arcade machines), an outdoor pool and family entertainment. There are plenty of shelving units to store your things and even an open wardrobe to hang your clothes (although hangers are not provided). There are also steps leading straight down to a private (rocky) beach – ideal for splashing about in the sea, playing with shadows, rock-pooling, exploring (very shallow) caves, climbing, and stone skimming. Staying in the Safari tent was a real mix of staying in an ordinary tent with what it is like to stay in a caravan. However, Glamping was by far the most spacious way to spend time as a family and a better night’s sleep than either staying in a tent or caravan. 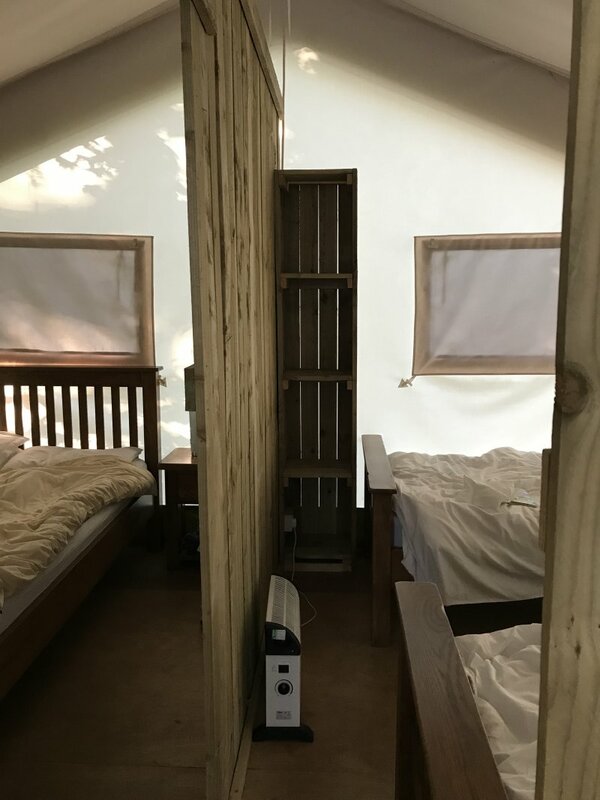 The canvas of the Safari tent was perfect – nice and airy and light – giving a feeling of space; but also perfect for keeping the temperature nice and allowing the natural light to come in (and go once it was dark). There were plenty of windows – which could be closed, opened with a rain cover, or opened with a net to stop insects (we never once found anything unwanted in our Safari tent). I loved the little touches that made it homely – such as the pictures on the walls, the rug and the elephant cushions. I really liked the way the rooms were divided up with like wooden pallets – which gave privacy but reassurance that the children were safe (there was a curtain dividing the living area and bedrooms for extra privacy too). In fact the whole camp felt safe and I did not mind letting our 9 year old go to the toilet on his own, or leaving our things unsupervised in the Safari tent. The fact that there wasn’t a toilet in our tent and we had to go to the block actually meant that we could all (pretty much) go at the same time. I also liked how the children could brush their teeth at our sink (although that may slightly take some of the fun out of camping in a tent). Unfortunately, the showers were not that powerful/warm – and the distance away (which was still fairly short) was not as convenient as a caravan stay. Although the shower cubicles did have locks on the doors and a great mirrored bathroom cabinet. The kitchen area was great as it meant that we did not need to leave our tent to wash up or cook. Plus it was great to easily transfer the food to the table. Normally we do not have the room to eat together when camping (in a normal tent or caravan) but the Safari tent had a big dining table which we could all fit around to eat (5 of us went, 2 adults, a teenager and 2 children ages 9 and 8). We happened to have a beautifully sunny stay but it would have been even more ideal if it had rained, as opposed to staying in a normal tent. I loved the fact that there were pathways to the tents – so at no point would we have to have got muddy if it had of rained (or at least lessened the likelihood). One problem with the resort was the fact that children’s activities need to be booked the night before, and as we did not arrive until late, ours could not join in as it was full already. I also heard other parents complain about this as it is written on the flyer but they had assumed that was just for activities such as the Water Walkers (which are provided free of charge). This was just a small campsite but just perfect for a relaxing break to get away from it all – and I feel offering just the right amount of entertainment for our needs. I definitely could see us glamping again. It meant we could arrive late and my husband did not have to worry about putting a tent up, and then taking it down and drying it afterwards. We had so much more space and I think this was the result of a much more pleasant stay. The location was stunning and a perfect break to #gogadgetfree (free WiFi was available in the bar). Hands up I found it hard but that is probably because I had to take my iPhone with me. My teen kept telling me off saying I was on it when doing things such as “just” going through my photos to delete ones I didn’t need. I think he was right in that I probably am just addicted. I have started leaving my phone at home when I do the school run and someone usually always contacts me when I am apart from it (or I need it to contact someone!). I guess I can always catch up later but it isn’t true that nothing exciting will happen as my friend Emma only went and got married in secret this weekend! The children did better and discovered what it was like to be bored and having to use their brains to think of things to do. It even saw each of us spending more time together – including a lot of one-to-one time. Board games were played, the children occupied themselves together (especially nice when they were holding hands in the sea), we bought a puzzle book (which all the boys enjoyed), there was lots of reading, building of LEGO (together taking it in turns to read instructions, find pieces and build the model – which our youngest son has been doing in school to help with communication), we had a picnic, went swimming and we bought a football (which the boys enjoyed a kick about with each other, and with their dad). I am sure there is much more that we did but it was really nice. Apparently you need at least an hour before going to sleep without being on devices – as the children generally do not play them in the week I did not see a difference in sleep. In fact they hardly had any as they were so keen to get up and use their day! I had thought that maybe the lack of games to play would have meant they would have slept – but it didn’t. My husband, on the other hand, did sleep longer and earlier – I think maybe without devices keeping him awake. 5-10 years – as close to 1 hour a day as possible. 10 years and over (including teenagers) – a maximum of 3 hours a day. Campsites.co.uk lists more than 850 campsites and glamping sites around England, Scotland, Wales and Northern Ireland. *okay so there were 2 mobile phones used and they belonged to the adults but this was (mainly) for navigation, photographs and the like. There was little internet and used only minimally (one was to communicate with our oldest son). 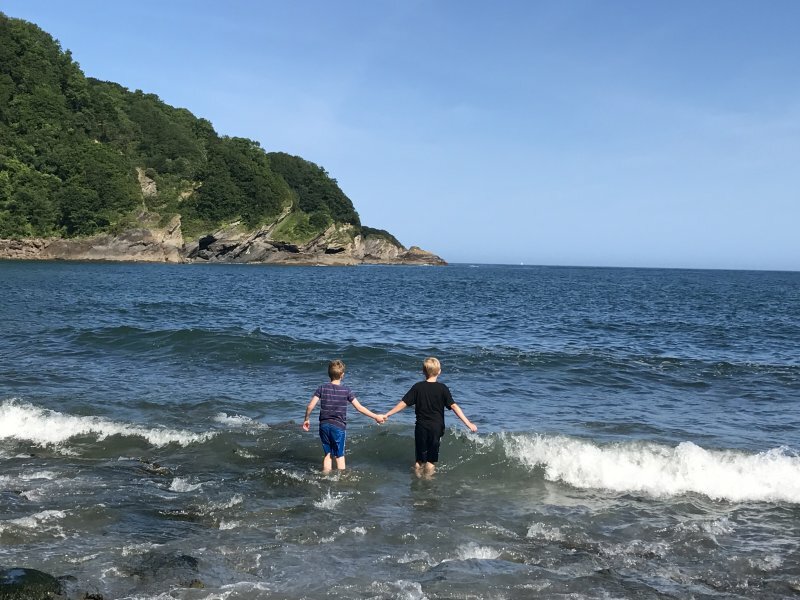 We were invited to spend the weekend by Campsites.co.uk to stay in a safari tent, at John Fowler Holidays Ltd.’s Sandaway Beach Holiday Park in Combe Martin, all words and opinions are honest and my own. This kind of camping would work for me, I love the thought of proper linen and running water and keeping insects out. They are all great in the day but being bitten at night is no fun. I like the sound of your small site, though a shame about the booking of the kids activities. As for screen free time you know I’m with you all the way, I love mine to leave it be and get out to enjoy themselves at every opportunity. Looks like your kids did better than you, though to be fair you did have to create the photos for this review and beautiful they are! I really enjoyed your video, I’d love to go glamping, we had so much fun as kids when our parents took us camping. There were no gadgets around then! 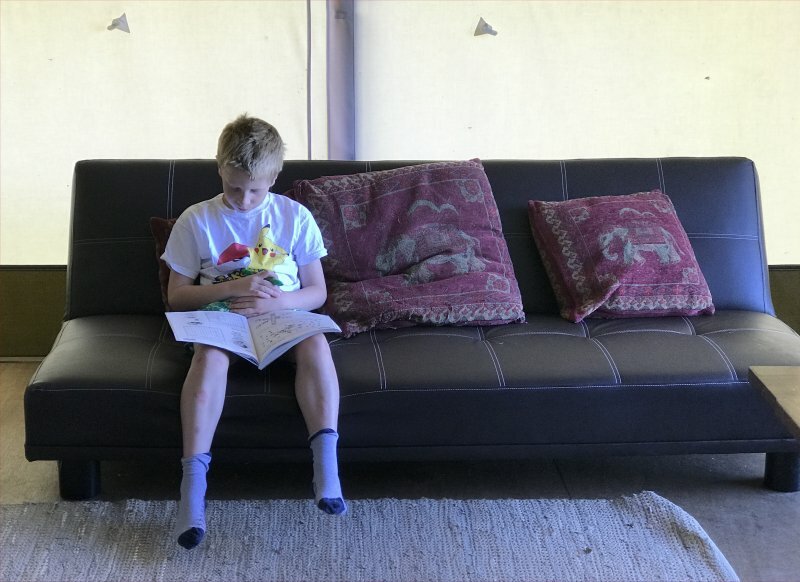 We recently had a caravan holiday and my kids did not miss gadgets at all. They only watched tv a couple of time, in the evening when we didn’t go out. And only one of my kids went on my phone and she only did that a couple of times because of my mobile data. Me and the hubby only used our phones for phone calls (when we were apart on the camp) and very occasionally to post photos on Facebook. So we were not completely technology free but we were not actually thinking about it, we just naturally went without for most of the time. I have never done glamping but it does sound amazing! Loved the pictures too. I like the sound of glamping and this looks like a beautiful location. great tips. We have been trying to have a screen free or gadget free day once a week. It was harder at first, getting everyone into the “habit” but the more we do it, the more benefits we see!